There are many agencies and groups who monitor water quality in the Okanagan. This list isn’t exhaustive, but provides links to websites and reports on water quality information. The BC Ministry of Environment & Climate Change Strategy in partnership with the City of Kelowna, the Regional District of Central Okanagan, and the District of Summerland began a seasonal sampling program on Okanagan Lake in 2011. This collaborative monitoring on Okanagan Lake combines resources from three local governments and the province, to provide high quality, integrated, and timely water quality information to guide planning and management of Okanagan Lake into the future. Environment Canada (EC) has a water quality buoy on Osoyoos Lake. They have three sites (Okanagan River/Oliver, Equesis and BX) where they do macroinvertebrate monitoring as indicators of stream health – the CABIN program. A separate group is sampling 5-10 sites a year for pharmaceuticals, and has also done some pesticide testing. They are also testing Mill Creek and Osoyoos Lake for Bisphenol A, perfluorinated compounds and Triclosan. The BC Ministry of Environment & Climate Change Strategy (ENV) has developed a new website for the BC Lake Monitoring Program where you can access lake locations and monitoring data using the interactive map. ENV does twice-yearly water quality trend monitoring in Ellison, Wood, Kalamalka, Okanagan, Skaha and Osoyoos, and monthly sampling at the outlets of Coldstream, Mission and Shingle Creeks. They do “extensive seasonal monitoring” at Armstrong Arm, Okanagan Centre, Kelowna, and Summerland. They develop water quality objectives for streams, and report on the attainment of these objectives every 5-7 years (Kelowna area creeks, Coldstream creek, Vernon area and Westbank/Peachland area creeks, Okanagan Lake, and Osoyoos Lake (first year of sampling was 2015); objectives are being developed for Wood Lake and Penticton area creeks. Water chemistry results are publicly available and stored on the Environmental Monitoring System (EMS). Any other specific water quality reports are uploaded to the ECOCAT online database. The BC Ministry of Forests, Lands and Natural Resource Operations (FLNRO – Groundwater) operates two groundwater quality monitoring networks: the Provincial Observation Well Network and the Ambient Groundwater Quality Monitoring Network (in Osoyoos, Oliver, Hullcar, and Eagle Rock areas), sampled annually. 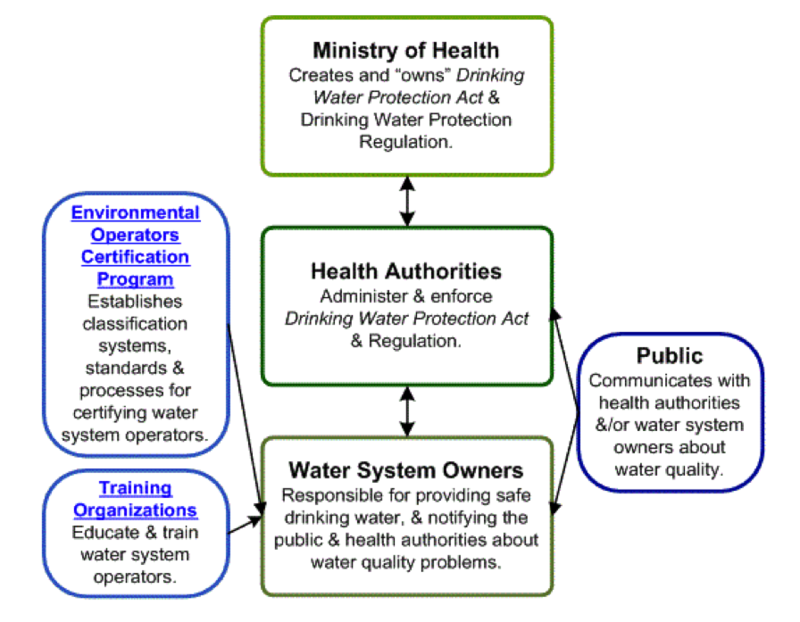 The overall goals of these Networks are to characterize the water chemistry of the aquifer, identify any parameter that exceeds health standards or is trending in a direction that would impact human or ecosystem health, and help raise awareness about the link between land use practices and water quality. Interior Health (IH) tests water quality for water supply systems and beaches. To find water sample results for a water supply system or a beach, go to Interior Health Water Sample Results. Select a geographical region from the drop-down menu to view ALL samples within that region (e.g. “Okanagan”), or SEARCH by Facility or City by entering the first 3 letters into the search box. For example, to find beach water sample results for “Paddlewheel Park”, type “pad” into the Facility search box, then follow the link to “Paddlewheel Park Beach”. To find water quality results for Okanagan beaches, select “Okanagan” on the drop-down menu for REGION. Or, type in any CITY to find the latest water quality tests. Click on “Test Type” (second column of search results) to re-sort the pages so that beaches are at the top. Water Suppliers collect data on raw water samples at their intakes, primarily bacterial and turbidity sampling, but also regular tests on water chemistry. This is the most complete and detailed source of water quality monitoring. Large utilities maintain their own data. IH stores data for small water systems. 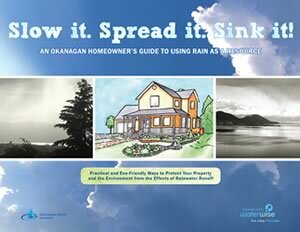 Many local governments also have reports on Stormwater, like this chapter from West Kelowna’s Master Water Plan. Okanagan Nation Alliance collects water quality samples for phytoplankton, zooplankton, Mysis, water chemistry, and physical properties to support their fisheries work on Osoyoos and Skaha Lakes, sampling several times a year. In 2006 and 2008, they did studies with Health Canada on contaminants in food fish (burbot, whitefish, trout). Contaminants tested for included: mercury, lead, arsenic, DDT, PCB’s, PDBE’s, and other pesticides. Trace contaminants were found in all samples, but none above recommended consumption levels. UBCO led a project to study sediment cores in Osoyoos Lake in 2008 (report dated 2009), establishing the historical nutrient conditions. Researchers at the university continue to do work on endocrine disrupters, although they’ve not yet received any large research grants to support this work. Dr. Cigdem Eskicioglu, an Associate Professor of Engineering at UBCO, has set up her biosolids research lab to test for endocrine disrupters, steroids, and other markers of pharmaceuticals and personal care products, and most recently sampled from Okanagan Falls wastewater treatment plant effluent and the Okanagan river in August 2015. Dr. Jeff Curtis and his grad student are doing a study on the cycle and fate of nitrogen and phosphorus in effluent irrigation from the Vernon treatment plant. WWF (World Wildlife Fund) Canada is “taking the pulse of Canada’s rivers” with a Canada-wide assessment of the country’s watersheds, focusing on four indicators of river health and seven key threats. The Regional District of North Okanagan (RDNO) is undertaking water quality assessments of Swan Lake, which is located north of Vernon and south of Spallumcheen, mostly within Electoral Area “B”. The Regional District of Okanagan-Similkameen (RDOS) has undertaken water quality and land use assessments of Vaseux Lake that identify Shuttleworth Creek as the primary source of increasing sedimentation in Vaseux Lake. Osoyoos Lake Water Quality Society has a 30-year water quality data set, monitoring weekly from May to October. They test for temperature, depth, dissolved oxygen, pH, specific conductivity, and water clarity. The Society also notes changes such as excessive milfoil, algae blooms, and dead fish; they check the condition of the stormwater outflow pipes; and also monitor and report changes to the lakeshore such as the removal of riparian trees, and shrubs; and construction of walls and buildings within the high water mark (illegal without special permits from the Ministry). Report: Assessment of the changes in trophic state of Osoyoos Lake, B.C. : A Paleolimnological Assessment. Slideshow: Powerpoint presentation of Assessment of the changes in trophic state of Osoyoos Lake, B.C. : A Paleolimnological Assessment. Lake Osoyoos Association does bi-monthly testing from June-Septembers at four locations from the international border to the mouth of the Okanagan River. They test for temperature, specific conductance, pH, dissolved oxygen, chlorophyll, and water clarity. Society for the Protection of Kalamalka Lake collects monthly temperature and clarity measurements and shares them with the BC Lake Stewardship Society (since 2008). Heather Larratt, of Larratt Aquatic Consulting does water quality monitoring and project-specific sampling for many water utilities, local governments, and industry in the Okanagan, BC. She’s known as a local go-to person for blue-green algae testing, and also maintains data sets for clients. International Osoyoos Lake Board of Control sponsored a report on the water quality of Osoyoos Lake, as part of the 2013 renewal of their Zosel Dam operating orders. The Washington Department of Ecology has a Water Quality Improvement Project for the Okanogan River, which is part of the implementation plan of a Total Maximum Daily Load (TMDL) regulation under the EPA’s Clean Water Act. The waters don’t meet health criteria for DDT and PCBs in edible fish. The TMDL was established in 2005, and Ecology will be monitoring through 2015.